Welding codes state that the "certification" of a welder is the responsibility of that welder's employer. When we conduct testing of a plate or pipe for welder certification, we sign the appropriate code form, stating that we conducted the testing of the weld to the requirements of the applicable code. The form must then be signed by the employer, certifying that all the information reported on the form is accurate and in accordance with the code. All of the codes allow an employer to conduct welder tests at their own facility. We offer services to process the required testing and provide the required code documents. As the employer is responsible for the information on these documents, providing us with complete and accurate information is very important. We kindly ask that you provide us this information in the forms below, and send the form in along with the test material. ​The Send-in Welder Qualification Test Data Sheet asks for several pieces of information. Each check box and blank space represents an essential variable that greatly influences what the welder is qualified to do. Often, we have customers who do not completely fill in this form which poses a serious issue. ​When filling out this form, it’s very important to note what code the welder is testing to, what position the piece was welded in (and note vertical progression if applicable), and what process was used. In addition, the base metal specification and grade, filler metal classification, and the joint type (whether it was welded both sides, with backing, or without backing) are critical. Be sure to fill out the form completely and accurately to ensure we get you the certification you need. ​ The Send-in Procedure Test Data Sheet asks for a lot of information. Each blank space represents an important variable that can greatly influence what the procedure qualification covers. Often, we have customers who do not completely fill in this form or who fill it out incorrectly which poses a serious issue. Before welding the test coupon, there are a few things to consider. The welding code, welding process, base material(s) and thickness, filler metal(s) and the joint design must be determined. If you have any questions or concerns about how to set up your procedure, feel free to contact us and ask for our engineering department. After tacking the plates together, measure and record the root opening and root face of the joint. Before welding and at the start of each pass, measure and record the temperature. Also, record the filler metal used and its diameter for each pass. For constant current processes, record the amperage the machine is set to and the average voltage achieved during each pass. For constant voltage processes, record the voltage setting and the average amperage achieved. Also during each pass, record the amount of time it takes for the welder to weld a given distance. This is used to calculate travel speed. It is crucial this be done for every pass. What we do when we administer a procedure test at our facility is we record the amount of time it takes for the welder to consume an electrode and then measure the distance he/she travelled. It’s very important this information be recorded for each and every pass. Regardless of whether the procedure being welded has five, fifty, or even 150 passes, every pass needs to be fully recorded. At the bottom of the page, there’s a box in which the joint geometry with the dimensions listed above is to be drawn. Also, draw in the location of each pass as it’s welded to track the progression of the weld through the joint. This step is exceptionally important on temper bead procedures and procedures requiring post weld stress relief. 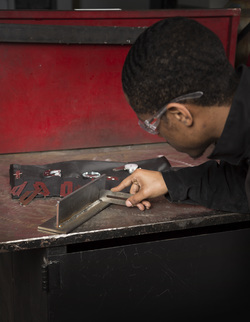 After welding, read through each item on the data sheet and record the variables used during welding. As mentioned above, each variable greatly influences the qualification limits of the procedure, so be sure to record all information completely and accurately.